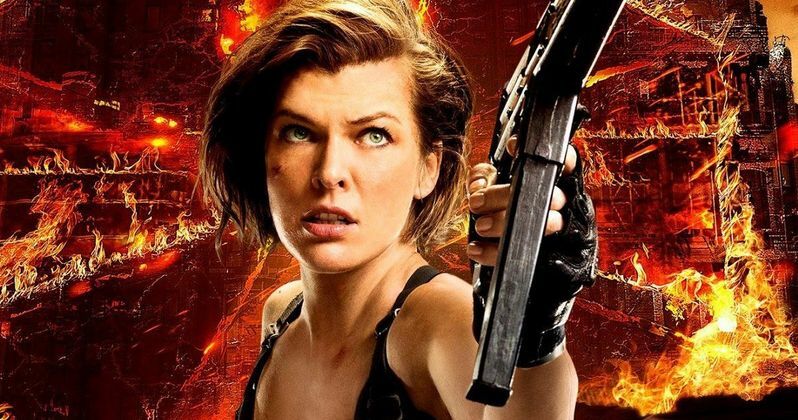 Last month, we showed you the latest posters from Sony's highly-anticipated Resident Evil: The Final Chapter, which featured Milla Jovovich's iconic character Alice Abernathy doing battle with the zombie hordes in Raccoon City. With just over a month left before this hits theaters in January, Sony has released five new character posters, featuring Alice, Ali Larter's Claire Redfield, Iain Glen's Dr. Alexander Isaacs, William Levy's Christian and Ruby Rose's Abigail. Hopefully we'll get to see another trailer with all these characters in action before this final sequel arrives in theaters. These new posters debuted on Facebook earlier today. Picking up immediately after the events in Resident Evil: Retribution, Alice (Milla Jovovich) is the only survivor of what was meant to be humanity's final stand against the undead. Now, she must return to where the nightmare began - The Hive in Raccoon City, where the Umbrella Corporation is gathering its forces for a final strike against the only remaining survivors of the apocalypse. Sony Pictures has set a January 27, 2017 release date for Resident Evil: The Final Chapter, putting it up against Warner Bros.' comedy Bastards, Universal's dramatic comedy A Dog's Purpose and EuropaCorp's The Lake. Milla Jovovich is joined by a number of franchise favorites in Resident Evil 6 such as Ali Larter as Claire Redfield and Shawn Roberts as Albert Wesker, along with a slew of new characters. Among these new additions are Ruby Rose as Abigail, Iain Glen as Dr. Alexander Isaacs, Eoin Macken as Doc, William Levy as Christian, Fraser James as Michael and Japanese model Rola as Cobalt. This adventure is based on Capcom's hugely popular video game series, which has grossed over $1 billion worldwide to date. The first five movies haven't been huge hits at the domestic box office, with 2010's Resident Evil: Afterlife earning a franchise best $60.1 million. The franchise has always been quite strong internationally, though, with Resident Evil: Afterlife taking in $296.2 million worldwide from a $60 million budget, and the last installment, Resident Evil: Retribution earning $42.3 million domestic and $197.8 million internationally for a global total of $240.1 million, from a $65 million budget.Director Paul W.S. Anderson teased in August that fans can expect a "full-circle return to Raccoon City and the Hive," where the first Resident Evil movie started the franchise back in 2002. Paul W.S. Anderson directs Resident Evil: The Final Chapter from his own screenplay and serves as producer alongside Jeremy Bolt, Robert Kulzer and Samuel Hadida. The director has written or co-written all six movies. He directed the original Resident Evil in 2002, before returning to the helm to direct Resident Evil: Afterlife, Resident Evil: Retribution and next year's franchise finale, Resident Evil 6, to get ready for this final adventure in theaters, starting January 27.